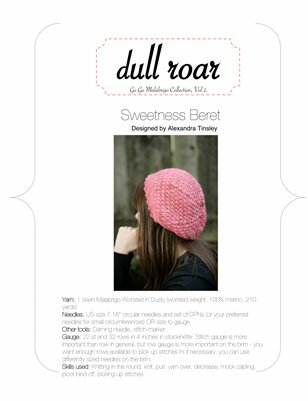 I named this cute, girly beret sincerely- it makes me think of fancy little pastries and sweet little pincushions… but now I can’t get that Smiths’ song out of my head* so I guess she’s got a touch of irony to ‘er as well. The brim is knit flat, diagonally, and seamed. The picot edging and main body of the hat are then picked up on either edge. The texture is a terribly easy mock cable pattern- no cable needle required!